Okay. Are they gone? Let’s dig in. We took our crew to see the new Disney movie Zootopia this weekend. It was bright, gorgeously animated, funny, and engaging. There are a couple of rather intense attack scenes that scared our youngest, but it wasn’t so bad that I’d caution others not to take their 4-year-olds. 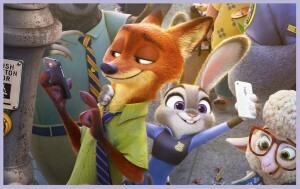 The movie follows a young rabbit, Judy Hopps, as she becomes the first-ever rabbit police officer in the big city of Zootopia. All the other cops are large, fast, mammals – and most of them are predators. The film sets the stage for great discussions about bias with your family. (No one expects Judy to be able to make it on the force because she’s small, female, and prey.) Her carrot-farming parents make some sweet and befuddled statements about giving up on your crazy dreams and doing what’s expected of you. There’s so much there for kids to easily see. Judy gets to work on her first real case when she learns about a missing otter. He’s got a wife and kids, and no one else is listening – so Judy sets out to find him. She ends up needing help from a hustler named Nick Wilde, a fox. Nick challenges Judy’s preconcieved notions about foxes as the pair works to uncover who or what is causing an outbreak of predator attacks all over the city. What I found really fascinating, though, was the possibility this film gave us to talk about intersectionality. There are several times when the Deputy Mayor, a sheep, says something to Judy about “us little guys have to stick together” or “looking out for each other.” We watch Judy fight against anti-prey biases and we root for her to prove everyone wrong and finally become a cop. After she cracks the case, Judy stands at the microphones giving her press conference and she states a few things she has believed to be ‘facts’ her whole life – that predators might not be able to control their animal urges, that their biology is to blame. Even though Judy has been fighting against the system that’s prejudiced against her – saying that she shouldn’t be discriminated against simply because she’s a rabbit – she still harbors prejudice against predators… particularly foxes. It’s only when she sees the hurt in Nick’s eyes that she realizes her instincts –actually her biases– have been wrong. That’s where, in my opinion, this movie serves as a great jumping-off point for conversations with our kids about bigotry, bias, prejudice, and most importantly the ways that sometimes we become so passionate about fighting for the rights of one group with which we identify – that we forget to fight for the rights of all. Many people only come to an understanding about fighting for the rights of excluded groups when they are either part of an excluded group, or when they love someone who is. I’m thrilled that Zootopia is an accessible story for helping parents explain this big concept to kids who may not be in the midst of a civil rights fight yet – because the earlier we learn the importance of seeking justice everywhere, for all people, the better. Guess what? I love my mama. So today’s a GREAT day.